Some might wonder what’s so special about this tiny square, but others are like me and love it without knowing why: Place Furstemberg, another charming hidden square in Paris. Although it’s in the heart of Saint-Germain-des-Prés, streets leading there are not among the busiest, and it’s very easy to miss if you don’t know it. 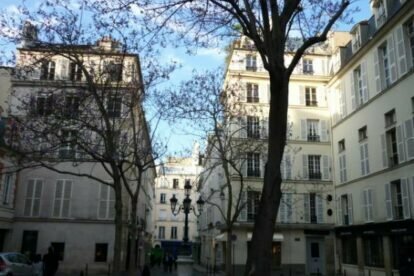 One of the smallest squares in Paris, its charm essentially comes, I guess, from architectural regularity, the majesty of its main tree (a paulownia), and its central five-lamps streetlight that give a theatrical atmosphere to the place early in the evening. At a corner of the square, Eugène Delacroix, one of the most important French Romantic painters had his last residence and studio, while he worked for the decoration of neighbouring Saint-Sulpice church. Now it is the small Delacroix museum, displaying some of his works and other painters of the same time. If you want to visit it, choose a sunny day, as you will be able to enjoy the small but charming garden next to former Delacroix’s atelier.